Siobhan Máire Deirdre Fahey (/ʃəˈvɔːn ˈfɑːhi/ shə-VAWN FAH-hee; born 10 September 1958) is an Irish singer and musician, whose vocal range is a light contralto. She was a founding member of the 1980s British girl group Bananarama, who had several top 10 hits including the US number one hit single "Venus". 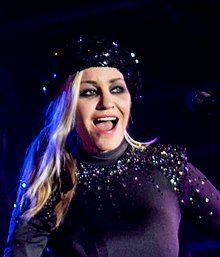 She later formed the Brit Award- and Ivor Novello Award-winning musical act Shakespears Sister, who had a UK number one hit with the 1992 single "Stay". Fahey joined the other original members of Bananarama for a 2017 tour. Fahey has two younger sisters, Máire (who played Eileen in the video of the 1982 song "Come On Eileen", a hit for Dexys Midnight Runners) and Niamh. Her parents, Helen and Joseph Fahey, both came from County Tipperary, Ireland. Fahey lived in Dublin for about two years, before her family migrated to Yorkshire, England, where her father Joseph was posted as a soldier in the British Army. Her family subsequently moved to Germany, then returned to the United Kingdom, where Fahey was sent to a convent school in Edinburgh, Scotland and attended schools in Stroud, Gloucester and Kent in southern England. When she was fourteen, she and her family moved to Harpenden, and two years later, she left home for London and became involved in the punk scene of the late 1970s. Fahey took a course in fashion journalism at the London College of Fashion, where she met Sara Dallin in 1980. Along with Keren Woodward, they founded Bananarama, and recorded their first demo "Aie a Mwana" in 1981. Bananarama then worked with the male vocal trio Fun Boy Three, releasing two top five singles with them in early 1982, before having their own top five hit with "Shy Boy" later that year. Fahey, along with Dallin and Woodward, co-wrote many of the group's hits, including "Cruel Summer", "Robert De Niro's Waiting...", "I Heard a Rumour", and "Love in the First Degree". In 1988, frustrated with the direction she felt Bananarama was heading, Fahey left the group and formed Shakespears Sister. Initially, Fahey effectively was Shakespears Sister, though American singer/songwriter Marcella Detroit later became an official member, making the outfit a duo. Their 1992 single "Stay" spent eight weeks at number one on the UK Singles Chart and won the 1993 Brit Award for Best British Video. At the 1993 Ivor Novello Awards, Fahey, Detroit and Dave Stewart received the award for Outstanding Contemporary Song Collection. Fahey often appeared in the band's music videos and on-stage as a vampish glam figure. After two successful albums, tensions began to rise between Fahey and Detroit and they split up in 1993. That year, Fahey admitted herself into a psychiatric unit with severe depression. In 1996, Fahey continued as Shakespears Sister by herself and released the single "I Can Drive". Intended as the first single from Shakespears Sister's third album, and her first record since her split with Marcella Detroit, the single performed disappointingly (UK number 30) which prompted London Records not to release the album. Following this, Fahey left the label and after a lengthy battle, she finally obtained the rights to release the album (entitled #3) independently through her own website in 2004. Fahey briefly re-joined Bananarama in 1998 to record a cover version of ABBA's "Waterloo" for the Channel 4 Eurovision special A Song for Eurotrash. Fahey reteamed with Bananarama again in 2002 for a "last ever" reunion at the band's 20th anniversary concert at G-A-Y in London. The trio performed "Venus" and "Waterloo". Fahey's track "Bitter Pill" was partially covered by pop band The Pussycat Dolls on their 2005 debut album PCD. The verses (which were slightly altered) and the overall sound of the song are from "Bitter Pill", but added in was the chorus of Donna Summer's "Hot Stuff". The song was renamed "Hot Stuff (I Want You Back)" and a remix was included as a B-side to their hit single "Beep". In 2008, Fahey appeared in the Chris Ward-written and directed short film What Shall We Do with the Drunken Sailor (based on the life of artist/model Nina Hamnett, self-styled "Queen of Bohemia"), with Fahey playing the role of Hamnett opposite actor Clive Arrindel, Donny Tourette (frontman with punk band Towers of London) and Honey Bane (former vocalist of the punk band Fatal Microbes). In 2009, Fahey decided to resurrect the Shakespears Sister name and released a new album. Entitled Songs from the Red Room, it was released on her own record label, SF Records and included various singles she had released under her own name in recent years. Fahey performed her first live show in almost 15 years as Shakespears Sister in Hoxton, London on 20 November 2009. In 2014, she joined the line-up of Dexys Midnight Runners for some shows, including at Glastonbury Festival. Fahey married Dave Stewart of Eurythmics in 1987; the couple divorced in 1996. They have two sons, Sam (born 1987) and Django James (born 1991). The two brothers formed a musical band called Nightmare & The Cat. As an infant, Sam Stewart appeared in early Shakespears Sister videos for "Heroine" and "You're History". Django Stewart is also an actor. Prior to her marriage to Stewart, Fahey was romantically involved with Jim Reilly, the drummer for the Northern Irish punk rock band Stiff Little Fingers and Scottish singer Bobby Bluebell of The Bluebells, with whom she co-wrote the UK No. 1 "Young at Heart". ^ a Since their inclusion on Songs from the Red Room, an album by Fahey's solo project Shakespears Sister, these songs are now usually credited as 'Shakespears Sister' rather than 'Siobhan Fahey'. ^ Larkin, Colin (2011). The Encyclopedia of Popular Music. Omnibus Press. p. 2381. ^ "Interview: Siobhan Fahey - 'Why should you stop if you're still inspired?'". The Scotsman. 21 January 2010. Retrieved 30 March 2014. ^ Sawyer, Miranda (19 May 1996). "She's Sold Millions of Records Over The Past 14 Years and She's Married to Another Pop Star, But She Never Gets Recognised in the Pub". The Observer. p. 18. ^ Nicholson, Rebecca (24 April 2017). "'People wet their knickers when they find out I was in Bananarama': the 80s trio return". the Guardian. ^ a b "Shakespears Sister - Interview". ^ "The Brits 1993". The Brit Awards. Retrieved 12 May 2017. ^ "1993 winners". The Ivor Novello Awards. Retrieved 12 May 2017. ^ "The Quietus - Reviews - Shakespears Sister". ^ "Discogs.com". Retrieved 15 June 2018. ^ 'WHAT SHALL WE DO WITH THE DRUNKEN SAILOR' (Chris Ward 2008) Archived 21 May 2014 at the Wayback Machine. kulone.com. Retrieved on 15 September 2013. ^ Shakespear's Sister on Spoonfed – Things to do in London Archived 27 February 2012 at the Wayback Machine. Spoonfed.co.uk. Retrieved on 15 September 2013. ^ Shakespears Sister confirm album, concert – Music News Archived 10 December 2014 at the Wayback Machine. Digital Spy (12 November 2009). Retrieved on 15 September 2013. ^ Siobhan Fahey's Back And Better Than Ever: style file: daily fashion, party, and model news Archived 6 February 2013 at the Wayback Machine. Style.com (24 November 2009). Retrieved on 15 September 2013. ^ "Dexys News". Dexysonline.com. Archived from the original on 14 July 2014. Retrieved 31 July 2014. ^ "'People wet their knickers when they find out I was in Bananarama': the 80s trio return". The Guardian. 24 April 2017. Retrieved 24 April 2017. ^ An article on "Nightmare & The Cat" Archived 15 March 2016 at the Wayback Machine. Perusheksindiemovies.wordpress.com (20 September 2011). Retrieved on 15 September 2013. ^ Gray, Chris (3 July 2002). "Violinist wins fight for royalties after musical interlude in the High Court – Crime, UK – Independent.co.uk". The Independent. London. Archived from the original on 30 September 2007. Retrieved 10 January 2010. ^ "Chart Log UK (1994–2010): Adam F – FYA". zobbel.de. Retrieved 11 December 2014. ^ "Official Independent Singles Chart Top 50 - Official Charts Company". www.officialcharts.com. ^ "Official Charts > Vegas". The Official UK Charts Company. Retrieved 25 May 2016. ^ "Chart Log UK 1994–2010 > Rodney P. – The Pussycat Dolls". Dipl.-Bibl. (FH) Tobias Zywietz. Archived from the original on 18 October 2015. Retrieved 21 October 2015.